My #imm12 experience began upon check-in at the lovely Champlain College. 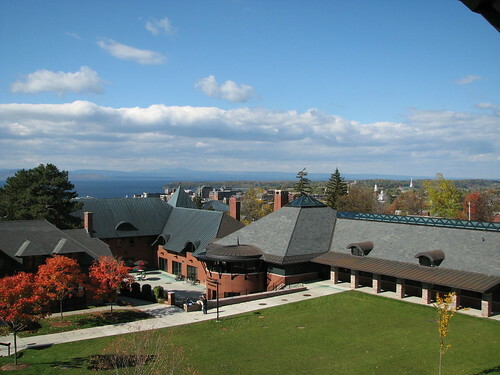 That gorgeous campus is also home to a nationally recognized library; Champlain College Library received the 2012 ACRL Excellence in Academic Libraries Award. After picking up my Teacher Track binder and biodegradable ACRL mug, I made my way to my dorm room at Main Street Suites. Along the way, I passed a historical marker for the birthplace of John Dewey, which seemed appropriate at the start of a week of professional development for educators. Sunday night’s program, the Welcome Picnic and Opening Remarks, was primarily about housekeeping and socializing, but we did do an activity I plan to incorporate into my instruction. I’m not able to share the actual document we used (Immersion materials are copyrighted by Immersion faculty and/or ACRL; they can be duplicated and used, but only for professional development purposes within the Immersion participant’s library and/or institution). However, the activity was a sort-of human scavenger hunt; we were each given a grid comprised of 16 sections, each containing a description and a question, and tasked with finding 16 different people who matched the criteria listed in the boxes in order to gather their signatures and responses to the questions. What’s the biggest lesson learned? What purpose does it help you achieve? There were some non-IL-related questions, too: someone who owns a dog, someone who walks to work, etc.. It provided some structure around which we could start to get to know each other. As an introvert, I sometimes struggle to initiate conversation, particularly in large groups of people I don’t know. The activity made it easier for me to do this by providing conversation starters and creating an environment in which we were encouraged to welcome and converse with each other. It set the tone for the week. Immersion is participatory. In order to attend, I had to read and sign an Immersion Learning Community statement containing the following: “Immersion is an active-learning based experience and I will be participating in a learning community. My role in that community is to be engaged and open to change, to reach for new personal learning, to listen and assist others with projects during the program.” Sunday night’s activity made it clear that the faculty were serious about active learning by engaging us from the start. It helped me grow my personal learning network. I added my completed grid to my Immersion binder, immediately following the list of participants and their contact information. Should I wish to connect with someone who works with freshman programs, someone who has taught an Information Literacy course, etc., I now have a list of folks with skills and experience in these areas. I can apply it in my classroom. One of the things I’d like to do in my new role of Professional Development Librarian is identify “hidden” skills and experience in the Libraries: who speaks French, uses WordPress, teaches with the SMART Board, etc.. Doing an activity like this would help us get to know each other a little better while helping me build a resource showcasing our knowledge and abilities.